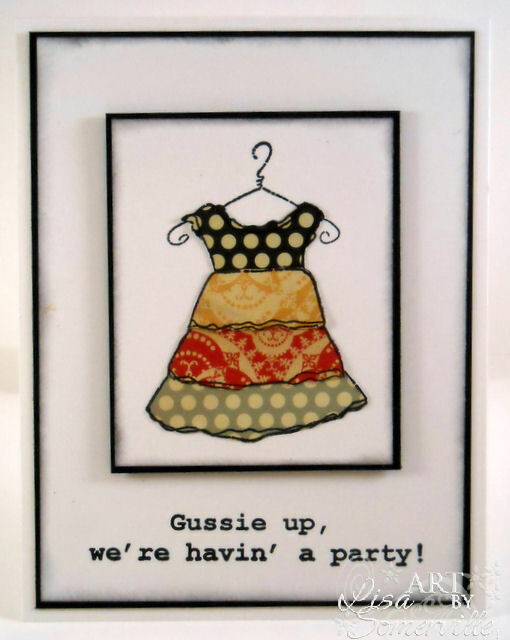 Designs by Lisa Somerville: Gussie Up....Put Your Party Dress On! Gussie Up....Put Your Party Dress On! I just love this new Pretty Party Dress image from Stampotique - it's one of the many new stamps being released today! When I first saw the image, I thought it would look fab paper pieced with the Cosmo Cricket Circa 1934 papers. I've got my party dress on, as I'm celebrating today! I'm lucky to share my birthday with some talented friends - Happy Birthday Gerrie, Sharon and Shelly, hope you all have a wonderful day! Besides releasing new images today, Stampotique is also the Sponsor for this weeks Going Grey with Scrap-Creations Challenge - the theme "Anything Goes"! So put your best stamp on and play along for your chance to win a $30 Stampotique Gift Certificate! While you have your stamps out, don't forget to enter Stampotique's Animal, Insects and Bird Challenge entries are accepted through March 22nd! Love, love, love your party dress..BRILLIANT! Happy Birthday! So are you all rested and ready to celebrate? Have a wonderful day! Oh, love the party dress! So cute! Happy Birthday, Lisa! Wonderful card! Happy birthday Lisa! Love your partydress, what a fabulous idea! Have fun today! Happy Birthday, GF! Love the party dress! Hope your day is the best. Happy Birthday and your card is absolutely STUNNING! Oh my gosh, adorable party dress, absolutely love those papers! And a belated happy birthday.